Work. Work. More work— a routine most people who work in a corporation religiously follow. They fill their days with work, even on their weekends to achieve and meet the goals they have set for themselves. The tendency is with these extremes is that they commonly lose track of their days, confuse Monday with Sunday, Tuesday with Wednesday, et cetera. And for such a struggle, a calendar is used to aid such circumstance, which is also used to help anticipate for the coming days, weeks, months, and even years. 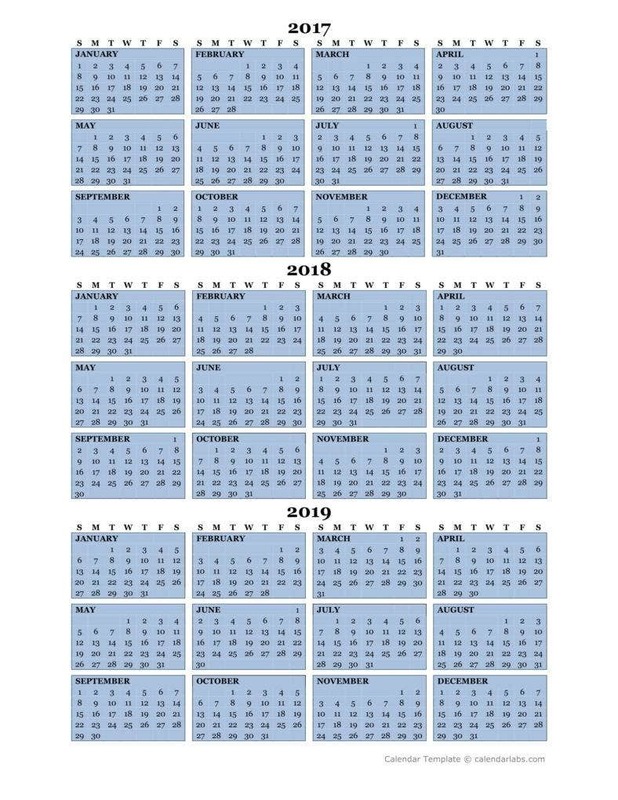 Most people are accustomed to one-year calendars, which only consists of the current year, sometimes printed in multi-pages with cultural designs. But, there are actually beauties that lie with opting to go for a three-year calendar, beauties that most fail to recognize and realize. Beauties that most do not get to see because of the tendency to just conform to the usual. Three-year calendars can most definitely help an individual in one way or another, in things they do at work or even with their personal stuff. Calendars were not always as present as it is now. Before, primitive people would base the numbers of days or even months and years by watching the seasons change— when the leaves feel when the flowers started to grow. It was their basis of the calendar to which help them determined what time of year they were in. For ancient people, with the likes of Romans, Greeks, and Egyptians, their calendar was based on the sky. To them, the sky was more than just a vast space of never-ending emptiness, it was so much more. They would use the sky to foretell events that might potentially transpire in the future and more importantly use as the basis of the day of the week. Over the years that have passed, decades, centuries and with all that history has recorded, there have been and is still many different kinds of calendars that are known to everyone. Each different from the other, but common in terms of the days and months that are in them. Often times, it is the number of days that set a calendar apart from the other, as some entail a lunar or solar year. As said, there are many different calendars known to people and as such are the Julian calendar which was name after Julius Caesar, there is also the Mayan Calendar; the Jewish and Muslim calendars, the Gregorian calendar which was named after the German Jesuit Pope Gregory XIII, and even a French Republican calendar. We have now come to a point in our lives where everything is at the tip of our fingers. Everything is greatly accessible especially with the rise and continued growth of smartphones. It is a known fact that smartphones have applications in them and one of it is a calendar, which entails so many features that make everything even more accessible— planning, reminding, and so on. With the power of a single applies the question why bother with an actual calendar, when you can simply have a look at your phone? Well, to begin, nothing beats a traditional. Everything around can be technologically advanced, but that one thing that is like how it was in years past will be the thing that is considered as new and fresh. People will eventually grow weary of having to constantly look at their phones and will at some point in a day or in their life need something different to look at, thus the need to still have actual calendars around our home, our workplace, or even in any setting that requires. An actual calendar means a tangible calendar, meaning it can be felt, touched, and experienced. A medium that is able to stimulate our senses. See the beautiful colors of the prints in the calendar, feel the texture of the cardboard or paper used, or even smell the freshly printed calendars. There is just so much to experience with a more tangible calendar that an application just simply cannot. Calendars that are not simply found in phones offer experiences that the other cannot. The simple flipping of a multi-page calendar is an experience itself already. The ability to attach post-its whenever there are tasks meant for that day to be accomplished is another experience. 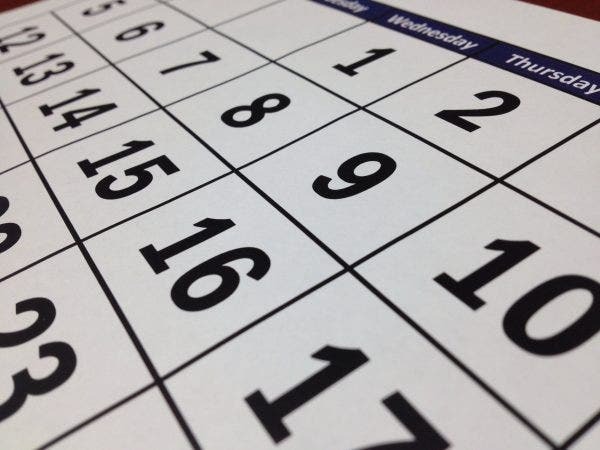 These simple things we normally do with a calendar are basically what sets it apart from an application of which we just simply look at, nothing more. Another asset to having an actual calendar is that you get to contribute to the preservation of the planet. Considering that it is usually made out of papers, cardboards, materials that can be easily recycled and reuse for another purpose, you can make use of it in ways you can come up with. With an actual calendar, you are helping in the minimization of wastes that contribute to the incrementing problems of pollution. Because you get to see the calendar in its actuality, there is the tendency that you see the progress you have made and what not. That said, a calendar can help you organize because you can just simply a lot of tasks or projects in a day with which you will be able to perform. And more importantly, you can keep track of your progress because the calendar is visible. 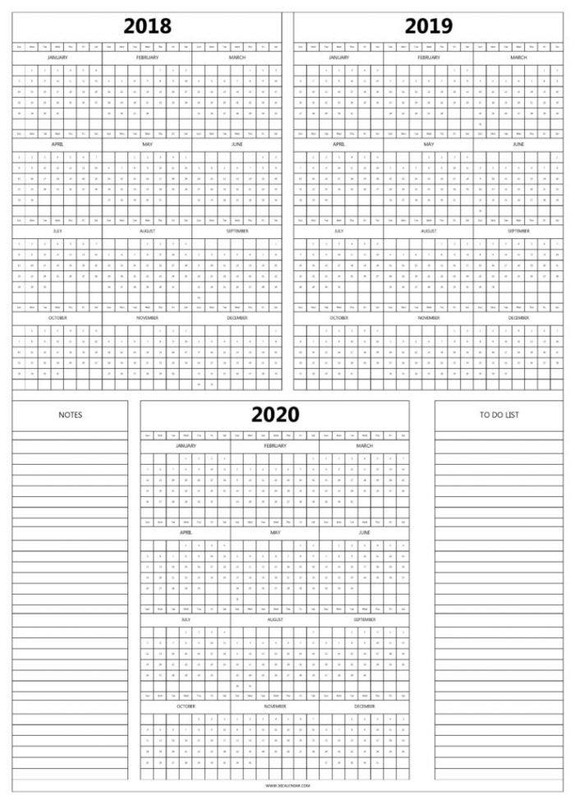 A three-year calendar is a calendar that consists of three years in one page. Commonly years that are consecutive to another. Most people usually do not opt for this kind of calendar for undetermined reasons, but there are reasons to why they should. Three-year calendars simply offer those who go for it efficiency and practicality, characteristics that most one-year calendars fail to impart. Since a three-year calendar basically consists of three years that are consecutive to another, it gives you the privilege to see days ahead. It has the capacity to give you an insight of what is to come. What days are certain events or holidays at. How many weeks in a month, and so on. It simply grants you the opportunity to see ahead. In line with being able to see ahead with a three-year calendar, you will also be able to plan events and tasks ahead, even those that will take place the following year. Three-year calendars provide an individual with an overview of the coming years, thus allowing them to plan ahead their events and tasks. Commonly, a three-year calendar is a kind of calendar that is a single page which makes it simple and efficient in terms of finding the day, week, and month. It is generally so much easier since everything is already laid out for you to see. How to Create Your Very Own Three-year Calendar? Creating your very own three-year calendar is not such a difficult task. All you need is the willingness to create (or maybe a little creativity) to full materialize your own. However, if you wish to just simply download templates, there are different ones you can use from that can be edited to your preference. But, if you prefer to do it yourself, prepare everything that you need. Before beginning to create your very own three-year calendar, first and foremost prepare all the necessary materials needed to create one. A cardboard or paper, a ruler, markers, glue, and some extra designs for design purposes. Prepare everything within reach for accessibility and convenience. But, before jumping into the whole process you have the option to create a calendar template with which you can just add designs to or simply jot down everything. However, for convenience go for printing a template to make things extra easier for you. If you opt to simply print a template, cut each column of the year and carefully arrange on the cardboard or paper in your preference. You can do it meticulously or creatively with unaligned edges or unparalleled lines. But, if you wish to do so manually, simply determine which area a year or month goes and write each down. You can add extra designs on your three-year calendar by adding some finishing touches to it. You can maybe add borders for a more simple yet attractive finish or you can extremes as bedazzling and making your calendar sparkle, the option is definitely yours to make. Calendars are a necessity in an individual’s life for they help them keep track of the days in a month and the months in a year. More so, keep track of the events and activities they have planned over the course of the year. And more importantly, calendars remind people that there are 365 days in a year and each one should be lived to its fullest. If you find this article helpful in any way, do not forget to bookmark this page for future references. And, kindly share this with other individuals seeking information about three-year calendars and also how to create one.